Maria Parker-Harris of Bournemouth has been crowned Mrs Enchanting World in a major international charitable pageant win. Former Mrs Dorset – Maria Parker-Harris – has brought home the international pageant crown after flying the flag for Dorset and winning Mrs Enchanting World. Maria Parker-Harris represented her home-county of Dorset at the Mrs Enchanting World Pageant on Saturday 10 March 2018 in south Wales and is delighted to have brought home the accolade. The pageant featured representatives from across the globe and finalists were selected from hundreds of entries. Mrs Enchanting World focuses on a contestant’s contribution to their community, their charitable endeavours and their dedication to a cause they wish to champion. Maria competed 113 appearances over her 6-month reign as Mrs Dorset; that showcased the beautiful and unique attractions in Dorset and supported local causes and events. 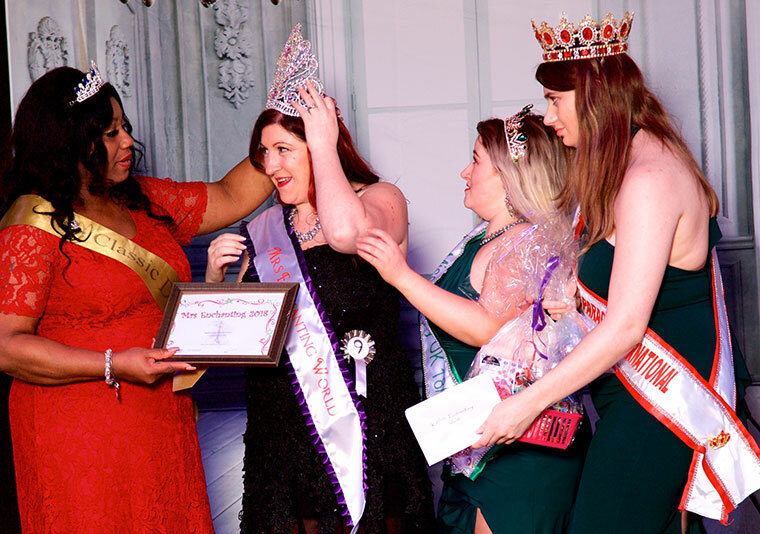 She also raised hundreds of pounds and was awarded the coveted Miss Congeniality award, voted for by her fellow contestants, recognising a contestant that has been welcoming and helpful over their pageant journey. During her reign as Mrs Dorset, Maria had chosen to campaign for better understanding of long-term infertility, a debilitating condition that has caused Maria and her husband great personal sadness. Maria will continue to work as an ambassador for Fertility Network UK and says she is proud to be able to raise awareness of the debilitating effects of long-term infertility on a national platform. Maria believes that long-term infertility could be much better understood by healthcare providers and wider society. Contradicting advice contributes to the desperation of struggling couples and leaves them vulnerable to scams and withdrawal from their social circles. According to the NHS, long-term infertility affects 1 in 7 couples, which is around 3.5million couples each year. Fertility Network UK states that around 90% of couples facing long-term infertility have experienced depression, 70% have reported strain on their relationships and 42% have considered suicide. The statistics are staggering and yet very little support and information is available to couples that are struggling with a difficult journey. Maria found that conflicting and dismissive advice from medical professionals only added to her anxiety until she had nearly given up on her dream of becoming a parent. Maria’s long-term infertility had isolated her from her friends and family. Like many couples, her condition made her feel ashamed and desperately lonely. Society does not openly talk about infertility and the resulting childlessness, which many studies have suggested can cause the sufferer to experience feelings of grief. Mrs Enchanting World encouraged Maria to utilise her title to share her story and support other couples that are experiencing the same destructive journey. During the process of conducting her pageant community and charitable work, it dawned on Maria that her vulnerability and plummeting self-esteem was largely due to the inability to share her experience with those closest to her, as you would with any other major life event. Maria finally reached out to her closest network for support and was overwhelmed by the response, with many couples sharing their story for the first time and couples on the journey stating the relief they felt at being able to share their burden at last. Maria strongly believes that no couple should ever have to face this battle alone and that long-term infertility should not be a source of shame. Maria vows to continue to raise awareness of long-term infertility, the resources available to couples and to encourage society to talk more openly about one of the final taboos. As Maria threw herself into attending local community events and campaigning for infertility understanding on social media, a miracle happened. In October 2017 and after being told that it was possible that pregnancy would not be an option for her, Maria was delighted to find out that she was pregnant. She is expecting her baby on 26 June 2018 and competed in Mrs Enchanting World while heavily pregnant. She wishes to be a beacon of hope to other couples and encourages them to look after each other, focusing their sadness into something positive like charity work, which can notably improve mental well-being.